Mold growth can start in as little as 48 hours after water intrusion. 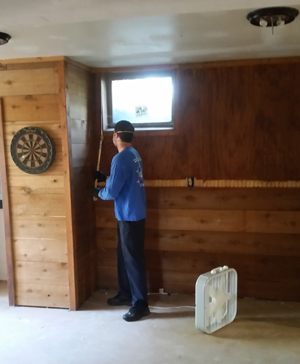 Our technicians have the training to treat any mold damage scenario quickly & effectively. While we find that most mold can be treated with minimal disruption, there are certain circumstances where traditional mold abatement can’t be avoided and sheetrock and other building materials must be removed from the structure. Mold Solutions by Cowleys performs this type of mold remediation work in addition to our non-invasive antimicrobial mold treatment. Of course, we employ all of the standard precautions used by traditional mold abatement firms when removing building materials from the structure to minimize the risk of mold and other airborne contaminants from escaping into and contaminating other parts of the home or commercial building. In addition to standard precautions, we take the added precaution of coating any building materials with a sealant before removing it to further prevent dislodging mold spores and risking a return of mold from new colony mold growth. The primary advantage of our antimicrobial treatment is that the mold is treated right where it grows. By killing the mold and rendering it inert, harmless, and non-allergenic, the movement of mold spores is minimized and substantial cost savings are realized because building materials are saved and the expense of reconstruction and temporary displacement of the occupants are avoided. To request a mold damage assessment and get an estimate for mold remediation, call us at 1-844-385-9604 or click below. We provide mold remediation and mold treatment services in Woodbridge, Toms River, Cherry Hill and many surrounding areas. Successful mold remediation requires proper mold containment, air filtration & removal of mold-damaged materials, completed by a qualified professional like Mold Solutions by Cowleys. The most commonly encountered situation is when sheetrock or other building materials have been so water-damaged from flooding or other severe water-intrusion events that they have lost their structural integrity. Once building materials have been damaged to the point of being unsafe and unsound, and no longer able to fulfill their intended purpose within the structure, they have to be removed. The building materials are being removed not because of superficial mold growth but because the materials themselves have been destroyed. Our mold technicians will determine whether the mold itself can be treated and the materials saved or whether the materials appear so damaged that they must be removed from the structure regardless of mold growth. A less common situation is that there is a high probability of concealed mold within the home or business. Often a mold test is performed because one of the occupants of the home is having chronic health-related issues whose symptoms appear to be mold related and, often, there was a water intrusion event or the home has an unacceptably high sustained relative humidity (RH) level. Mold can grow at over 50% RH, and at over 60% RH mold will thrive. Although there is no standards or thresholds for mold spore counts, if the test indicates that the inside of the home has a high count relative to the outside, all of these combined factors indicate a high probability of concealed mold. Our mold technicians will conduct a comprehensive water intrusion inspection, starting with the usual basement and crawl space trouble spots. The inspection usually finds out the source of the mold problem. 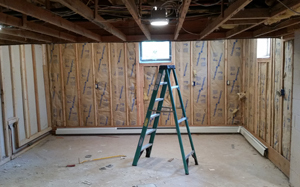 In certain cases, we will need to access wall voids and remove sheetrock in the process. Who do you call to remove and remediate mold in New Jersey? Mold Solutions by Cowleys has the training and expertise to remediate the mold in your home, in addition to our mold treatment solution to help prevent future mold growth. If you have signs of mold in your home, contact us today to schedule an inspection and estimate! We provide mold removal services in Bridgewater, Princeton Junction, Middletown, Old Bridge, Piscataway, New Brunswick, Lakewood and nearby areas.